Marshall Space and Flight Center's winner of a Research Technology Award worked with the Fourier telescope. 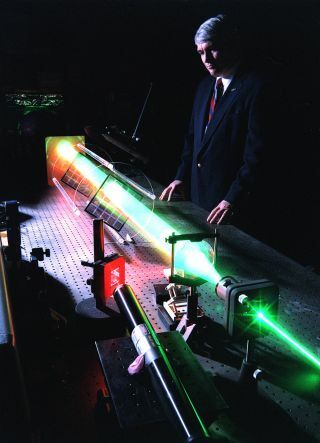 In this historical photo from NASA's archives, which was taken March 1, 1993, the Marshall Space Flight Center's winner of a Research Technology Award works with a Fourier telescope. NASA's Marshall center is based in Hunstville, Ala. The winning research project developed new technology with the aid of advanced computers by allowing an object to be x-rayed using an absorption pattern, then sending this data to the computer where it calculates the data into pixels which in turn develops an image. This new technology is being used in fields of astronomy, astrophysics and medicine.